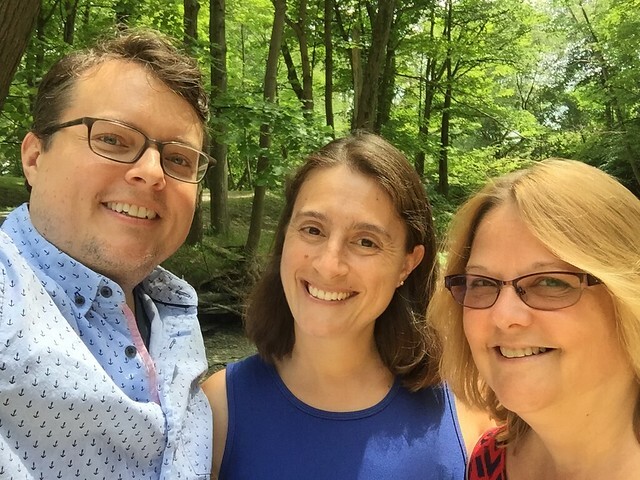 As we began planning our time in Pennsylvania, I knew we’d take our annual trip out to the wineries with Neil’s cousin Diane. I created a list of all the places we’ve visited in previous years as well as some of the brands that had been shared with us at picnics and dinners. Then I consulted the Lake Erie Wine Country website, my go-to guide when we come here. 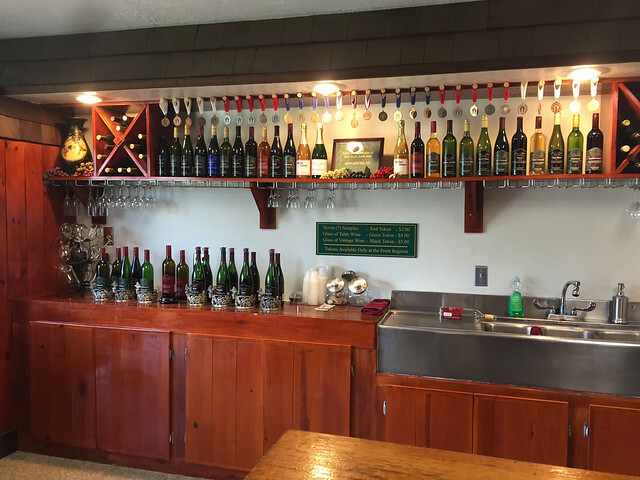 The wine trail goes up and down Lake Erie through Pennsylvania and New York. 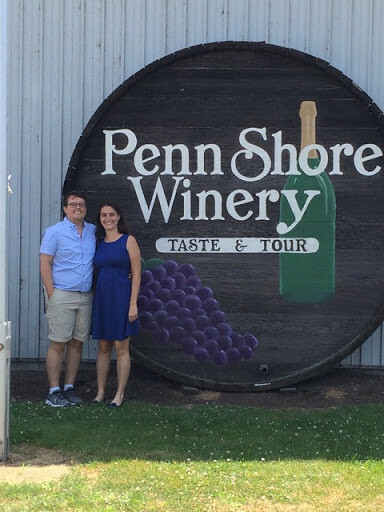 This year I chose two wineries in Pennsylvania within 10-15 minutes from where we were staying as I figured this year could be more of a relaxed wine tasting trip. 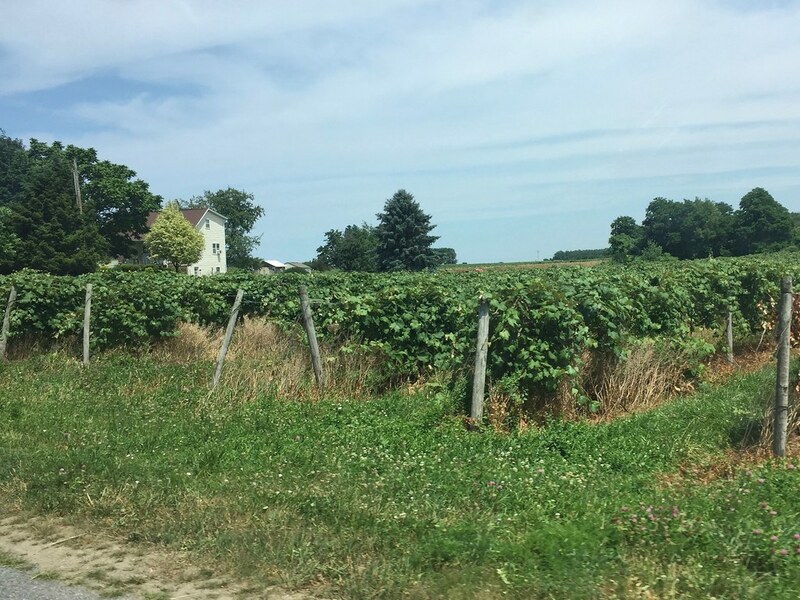 The first winery was Presque Isle Wine Cellars, which was not only close by but also their website suggested you could bring a picnic lunch and sit near the creek (locals pronounce this “crick”). 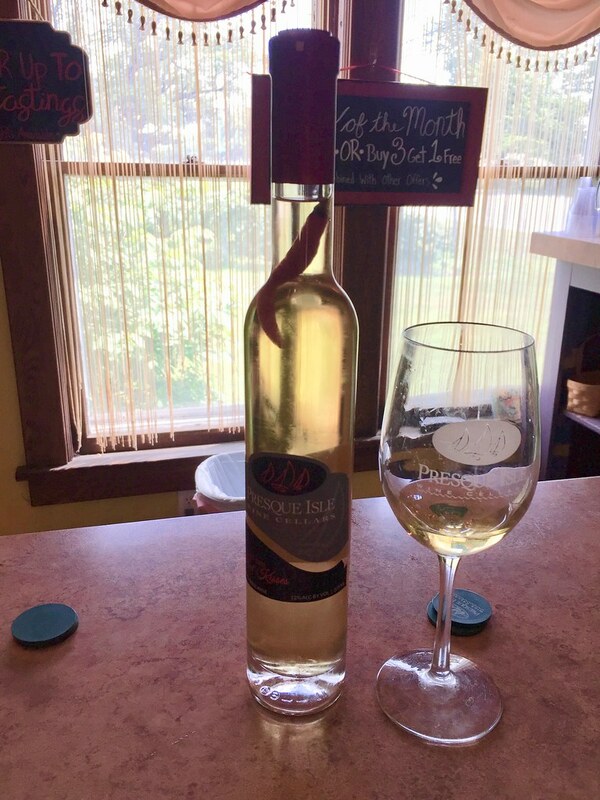 The second winery, Penn Shore Winery and Vineyards, http://pennshore.com, also made note of relaxing with a glass of wine as you take in the vineyard views. Sounds like just the break we could use! 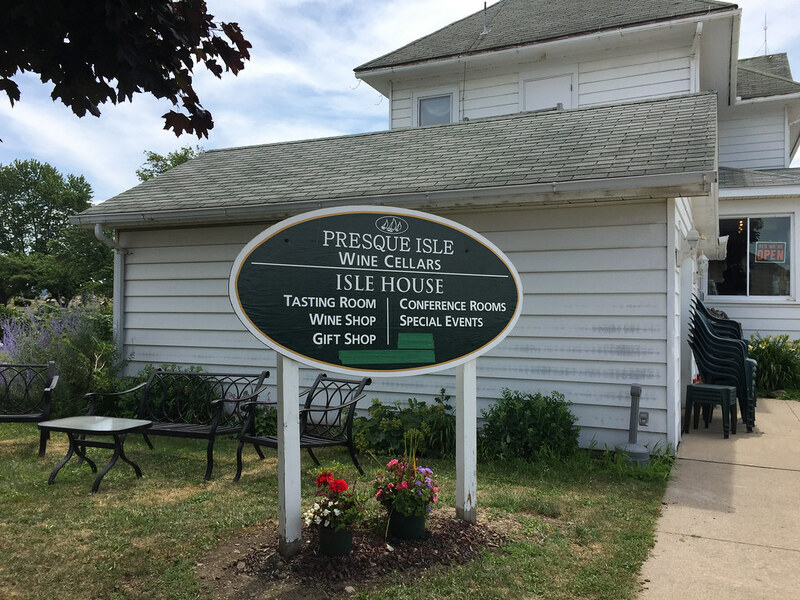 We were a little confused about which part of the Presque Isle Wine Cellars property the tastings were held. This organization offers winemaking supplies and chemicals as well as being a winery so their website has quite a bit on it. There was also mention of a restaurant but it seemed they were making some changes. 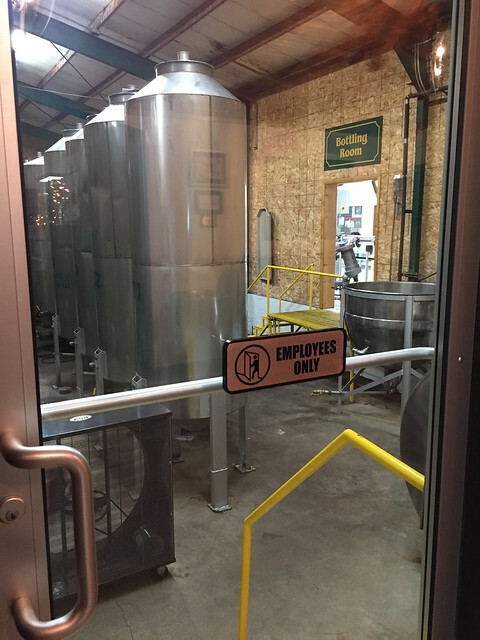 Luckily when we arrived, there was a sign that said “Tasting Room” so we found our way in. Khila, our wine server for the day, was in the process of filling some holes in the wall in preparation for painting the walls so apparently the transition away from restaurant was taking place now! Well that explains it! The wine tasting list was quite extensive (with over 30 wines) and there were a couple different options: $3 for 6 tastings or $5 for 6 premium wines. Diane and I chose the regular tastings and Neil chose the premium tasting. Then came the hard part of deciding which wines to taste. Luckily they were already separated into dry, semi-dry, semi-sweet, sweet, sparkling, fruit and premium. I think between the three of us we chose at least one from each category. 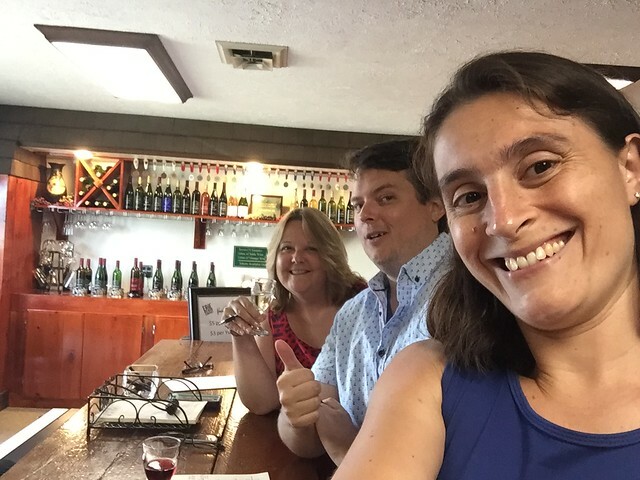 Diane typically gravitates to the sweeter wines and Neil and I generally enjoy drier wines. Although this trip I had a different strategy: choose some of the more popular wines for the area instead of trying to only stay in the dry categories. 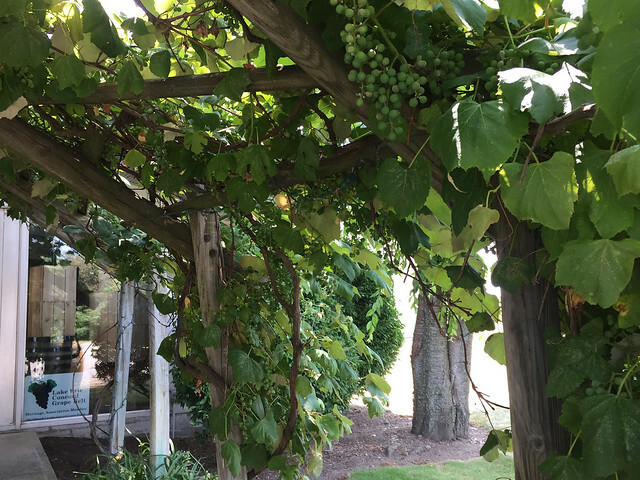 Some of the well-known grapes of the region are Concord (emphasis on the second syllable), Niagara, Catawba and Fredonia, but you can find Merlot, Pinot Noir, Chardonnay and some of the more traditional wine grapes too. One of the things that was hard to miss about the tasting menu was all the medals the wines had won! We tried so many Gold and Silver winners that day. Another thing we made note of was that the wines really did taste like the tasting notes on the menu, pretty cool. I began my tasting with the 2013 Viognier, making note of the butterscotch candy aromas, the light body and the toast flavor. Diane started with the Reflections, the wine of the month, and it didn’t disappoint her. She picked up a hint of champagne, a light body, and a hint of fruit. She’s not usually a white wine drinker so it really surprised her when she decided to take a bottle home! Neil, being the Pinot Noir lover that he is, began with his standby. I’d say it was pretty true to it’s varietal with a little funk, pepper, and earthy aromas. The flavors included pepper, very earthy flavors yet a light body and it was dry. Continuing through the Semi-Dry white wines I picked out the Riesling and Traminette. I knew that Riesling could grow in this region but I’m not sure if I’ve tried it in past trips. The initial aromas were a bit dry and musty but then it changed to lemon aromas. This was also a light wine but there were noticeable flavors of sweet grapefruit. Another wine true to it’s notes! I’ve heard of Traminette during our previous trips but I was pleasantly surprised when it had perfume aromas and a sweet but not too sweet flavor! Diane noticed similar notes when she tried the Blusé, a semi sweet rosé. She said it wasn’t quite dry or sweet but she did pick up watermelon and blueberry flavors. Let’s check back in with Neil and his Premium wines! Next on his list was the Carmine, a cross of Cabernet Sauvignon, Merlot and Carignan. Wow that sounds really interesting! It’s so cool how the grape growers up here have to be creative with the grapes they choose to grow since the conditions are so different from the other US regions. Neil picked up dark chocolate aromas and fruity flavors similar to cherry and raspberry. Next up he tried the Cabernet Franc, another grape commonly grown in these northern US regions. This one reminded him of a Chianti with pasta sauce and grassy aromas and a super slight cherry jolly rancher flavor. It seems neither of these wines matched up with the tasting notes but that’s all part of wine tasting, right? Diane and I both found a handful of wines to try in the Sweet Wines category. There were two blush wines in this section and we both started with the Blushing Heron, which Diane described as a great blend of Concord and Niagara grapes. The past 3 times that we’ve gotten together for wine tasting (and then the following party with all our goodies) we always have a wine with these 2 grapes so I was certainly curious to give it a try too. It smelled sweet, floral and very good! The flavor was crisp & sweet but also smooth like honey. Diane picked up a hint of strawberry, a light body and fruity flavors. She knew she’d want to bring a bottle to the party next week so she purchased one of the 1.5L bottles to share with everyone. The other blush wine is called Creekside Blush but as Khila suggested, if you like the Blushing Heron, you aren’t usually crazy about this one. Diane found it to be too light on taste, and she couldn’t decipher the fruit. Although it was blush, it was more of a strawberry red color. We both tried the Creekside Red, one of their newer wines, a blend of Fredonia and Chambourcin. These grapes were also familiar to me for this part of the US. I was surprised when I thought it smelled like vanilla birthday cake but then it changed to strawberry shortcake. This light wine had cranberry flavors and a smooth finish. 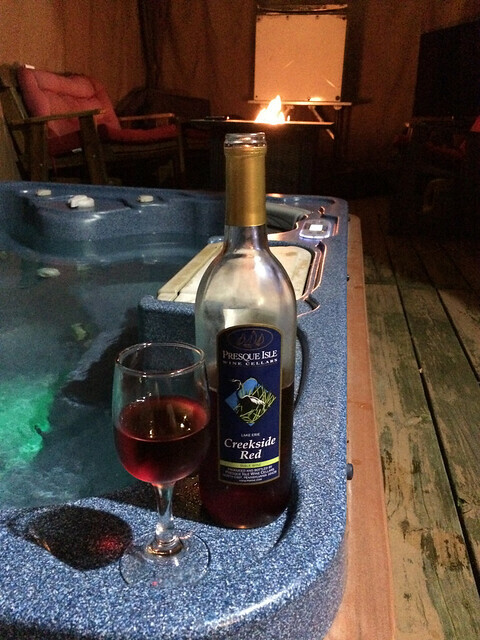 I knew it’d be a good one when we hung out in the hot tub the next day and it didn’t disappoint! Diane noticed the familiar flavor of the Fredonia grape but thought it tasted different than other Fredonia wines she’s tried. Presque Isle Wine Cellars purchases their grapes from many of the local growers as well as some local blueberries for their BluSecco and True Blue wines. Diane tried both of them and thought the dry flavor of the BluSecco would go well with chocolate cake. I thought it had a good amount of bubbles and could smell the blueberry aromas. Diane picked up the blueberry flavors in the True Blue and we were all intrigued when Khila suggested having it with shortcake and vanilla ice cream. 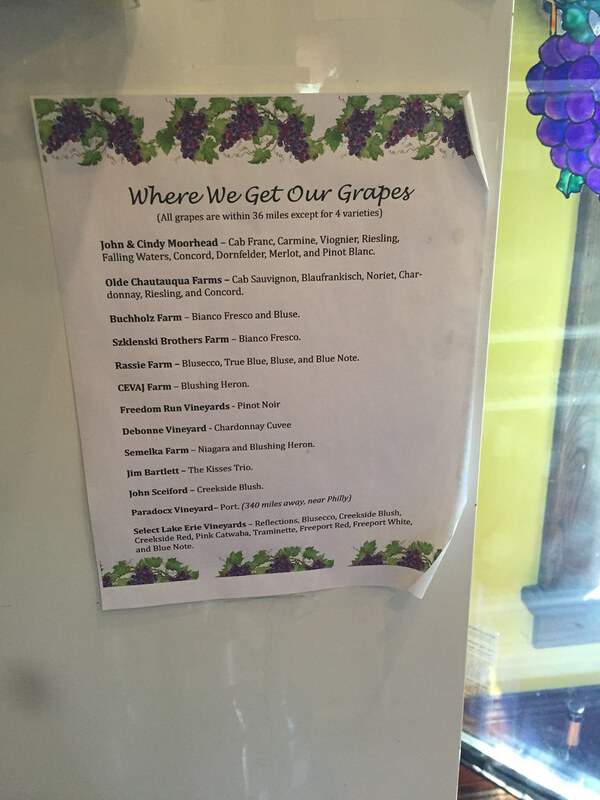 Another cool thing was that Diane knows a lot of the grape growing families around area so she picked out quite a few familiar names on the list. Neil was content in trying his other set of wines while Diane and I chose similar tastes. It seems he probably began with the Chardonnay Cuveé as I continue to write this up since white wines come before reds so let’s not miss out on that one. Neil picked up apricot aromas, citrus, honeydew melon, and slight mineral flavors. Another one of those traditional wine grapes that can also grow here. Have you tried wines from this area before? If you have, you probably know what type of wine Neil finished his tasting with: Ice Wine! 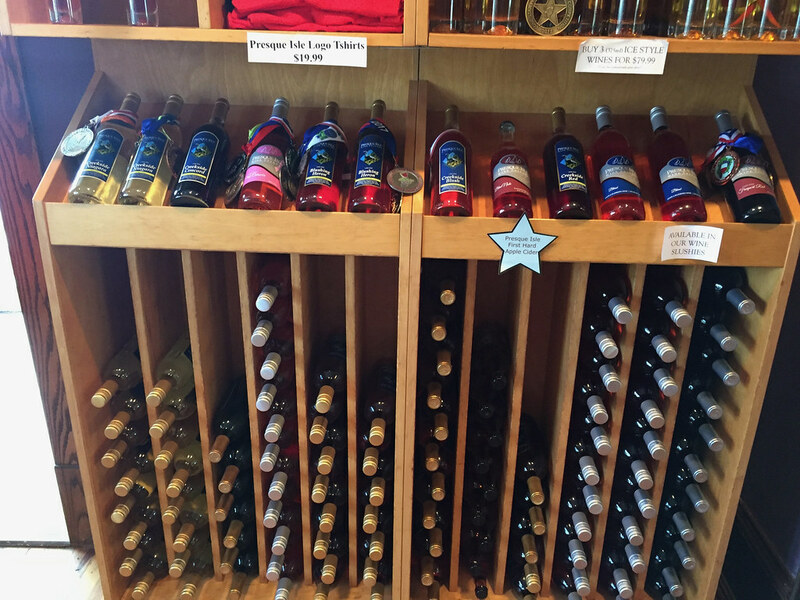 Presque Isle Wine Cellars makes 3 ice wines with the same base and then they have different things added to them. Neil had the chance to try the Cinnful Kisses with it’s apple pie aromas and cinnamon sweetness. He knew it would be one that the group would like next week so stay tuned for how that will pair with cheese! And if you know Neil, you know he couldn’t resist the Hot Kisses with a Thai pepper floating in it! It was very spicy, with big sweet grape and apple flavors. He was sad when he finished out that sample! 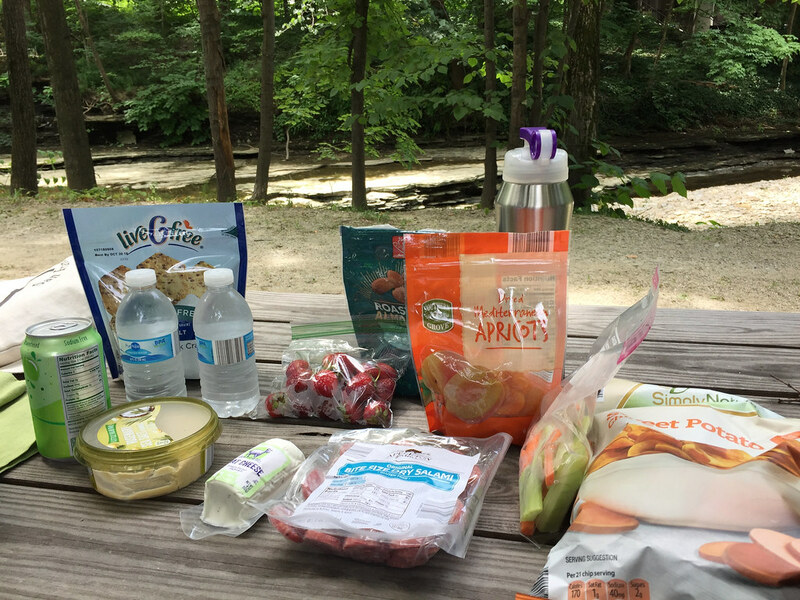 What a fun way to start the day but after our 6 tastes each, we were ready to have that picnic by the creek! We made our way down the picnic table and pulled out all our goodies. It was our traditional mix of meats, cheese, veggies, and nuts but definitely helped to get us ready to taste another set of wines. It was so peaceful, we could have stayed there all day! 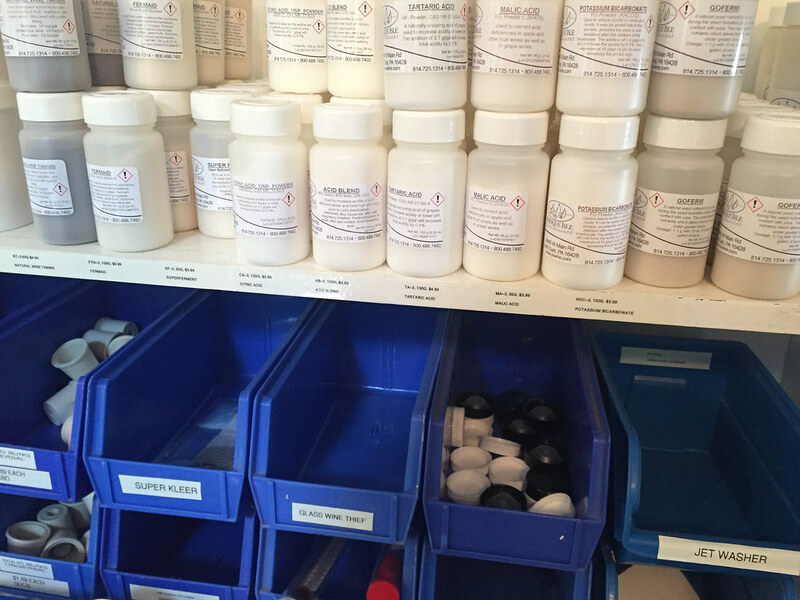 Before leaving, we stopped in the shop to see the wine making supplies and chemicals. It’s been a while since I’ve worked in a winery so it was fun to be exposed to that side of things once again. If you dabble in wine making yourself, check out their website for any supplies you might need! Just a short 10 minute ride toward the Lake and we arrived at Penn Shore Winery and Vineyard, http://pennshore.com. This building seemed more industrial than the first winery but the giant barrel head with their name on it certainly caught my eye. We walked under the pergola of grapes and entered the gift shop area. After a quick look through the wine trinkets, we began our tasting with Jenny. She let us know that we could taste up to 7 wines for only $2 and all the wines on the list were included in this pricing. The way the wines are broken down on the menu, it was a little tricky to figure out what order to taste them in but luckily Jenny gave us a hand. We all checked off the wines we wanted to try and began our tasting. The Vintage Wines part of the menu had some dry wines so let’s get started. Neil’s first wine was Seyval Blanc, a super tart, lemon, mineral flavored white wine. Diane and I began with the Reflections wine, a Riesling with the same name as the other winery, that’s confusing! Diane found it to be sweeter and not too dry. I thought this one started musty too but then it was sweet and tangy. I guess the Riesling is a little different here in PA. Neil and Diane continued on to red wines in this category. Neil tried the Chancellor, that smelled like a black cherry cordial but tasted “musky” with a little smoke. Diane tasted the Merlot, and questioned how she smelled the lake and old cheese. The wine was light with a full taste and a rich flavor. That’s quite a difference in flavor and aroma! My tasting path brought me over to the Table Wines section with the Burgundy wine. This wine is made from Marechal Foch, a local red grape. I picked up cranberry and light berry aromas. The flavors were sweet, black pepper and some acidity. Neil also tasted this wine and thought it smelled like a sweet cordial. He found musky, dark cherry and a hint of sweet flavors. Before the Burgundy, Neil tried the Dry Concord, which he described as very Concord, very good but not too sweet and a little puckery. There were a few Concord wines on the tasting list. In addition to the Dry Concord there was a traditional Concord. The aroma of the Concord wine transported Diane to a familiar scent that you pick up all over this area in September. Did you know that this area is famous for growing the grapes used in Welch’s products? Well now you do! She found the flavor to taste like Grape Koolaid, that’s pretty close to Welch’s grape juice so that makes sense. The final Concord wine, Lambruscano, was a blend of Concord and a hybrid grape. It had that token Concord aroma but also berries. The wine has a tangy, Concord flavor with a bubble gum finish. Diane noticed pretty much the same notes, she tasted the Concord grape, bubble gum and said it was not too heavy. 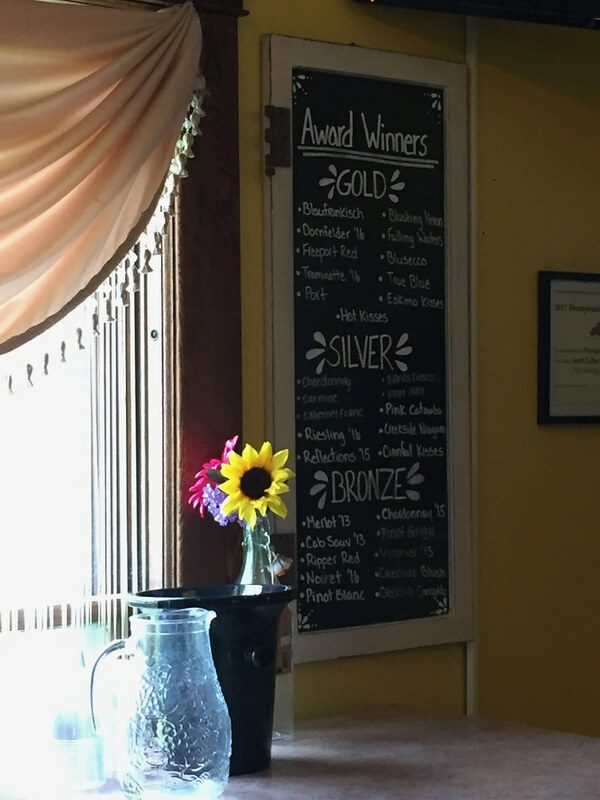 Jenny told us that the Concord wine always wins gold and double gold medals. And when asked about the most popular wine she said it’s definitely the Lambruscano. We must have known since all of us tasted these wines. Now back to some white wines. Neil and Diane both tasted the Diamond wine. Diane found it to have a great taste that was like tangerine with a light body. Neil found grassy and lake aromas but agreed with the citrus flavors similar to tangerine. He called it yummy and thought it tasted fortified. Diane found citrus flavors in the Crystal Lake White wine also. This one tasted like tangerine and mandarin but she didn’t care for the perfume aromas. I found it to smell floral too but there was an aroma of petrol, as well. The wine was tart but also sweet tangerine. I guess I started to have some palate fatigue at this point because every wine from this point on started to have bubble gum flavors and aromas. It all began with the Pink Catawba that smelled and tasted like bubble gum, weird! Luckily that didn’t happen to everyone. Neil liked the floral, perfume aromas, made note of the color being similar to a Provence rosé but it was a very, very sweet grape! The Bubbling Niagara was another wine that confused us. Neil could smell yeast aromas and it seemed almost beer-like but he thought it was really good. I liked the texture of the bubbles but tasted more bubble gum. Darn! We closed out our tasting with the Specialty Wines. Diane found the Kir to be on the lighter side and to taste like blackberries. I noticed earth and berry aromas but then found that bubble gum flavor again. Diane was excited to finish her tasting with the Holiday Spice wine. 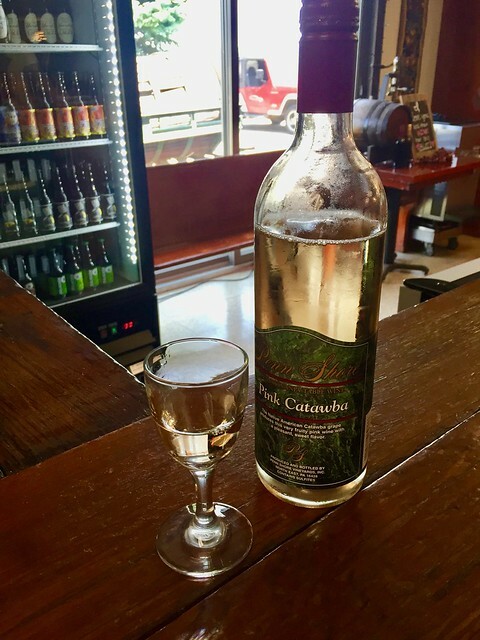 Many of the local wineries offer a wine like this and they suggest that you serve it warm. She said it definitely smelled like the holidays and had flavors of cinnamon and warm apple pie. She plans to go back in the Fall to pick up a bottle. We were grateful for all of Jenny’s help that day and her guidance through the wines from the oldest winery in PA. Another cool tidbit about the winery is that they use the Champagne Method to make their champagne, so it’s unofficially a “champagne.” Due to it’s labor intensive process, they have a limited quantity and don’t offer tastings of it. Shucks! Before we got going, we all talked about which wines we should purchase. Diane continued to surprise herself when choosing to take home 2 white wines, Crystal Lake and Diamond. Neil really liked the Dry Concord and decided to get two bottles, one for our group tasting and another just to enjoy. I liked the Lambruscano but thought the Dry Concord was pretty good too with the different levels of flavors in the wine. The winery did offer a self-guided tour too but we decided to save that for another day. Well, this impromptu trip certainly added to our haul to bring home. 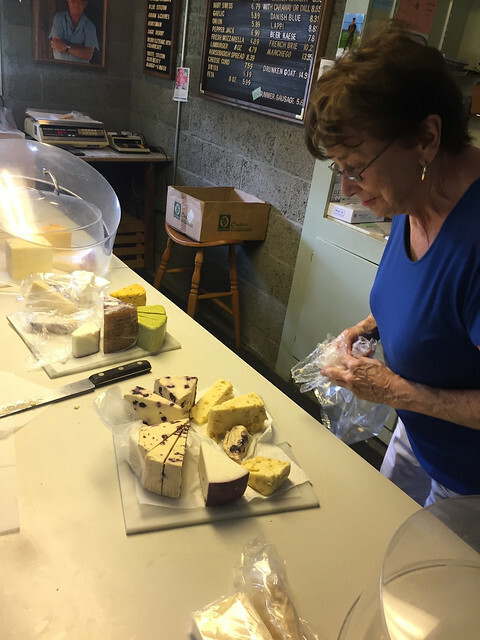 Diane knows how much her parents like the Cranberry Wensleydale and NY sharp cheddar so she didn’t have to think too hard about what to get. I remembered there was a terrific selection when we stepped into the store. Would it surprise you if I told you Neil and I took home 5 wedges of cheese? I know it wouldn’t. Funny thing though is that we picked out 3 that looked so tasty without even considering them to pair with wine. 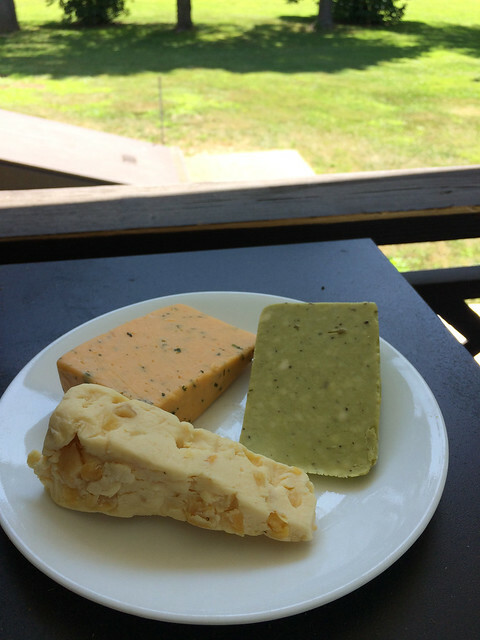 We just wanted to eat the Mango Ginger Stilton, Sage Derby and Onion and Chive cheeses! We also needed a couple cheeses to include in our Wine and Cheese Gift basket. We figured the NY cheddar and Blueberry stilton would be a nice complement to the sweet NY red wine we had in mind. 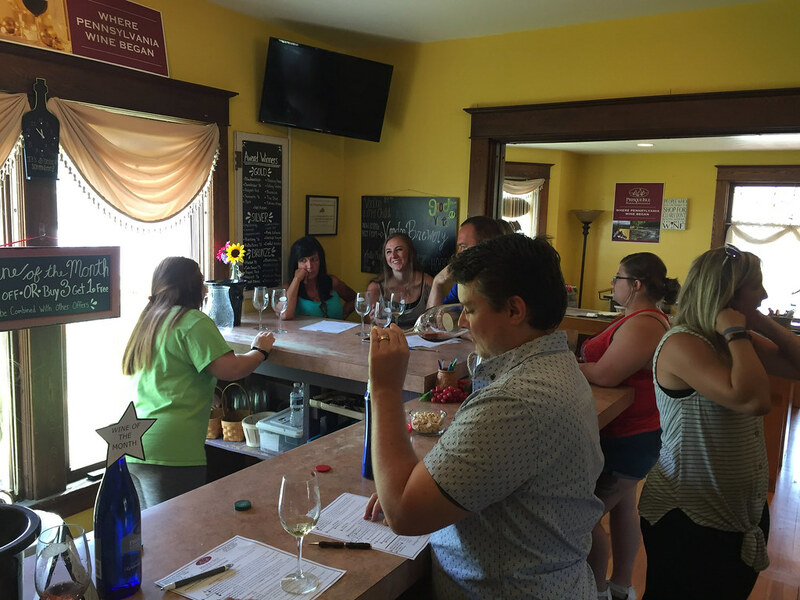 We always have such a good time wine tasting with Diane on the Lake Erie Wine Trail! There are so many vineyards, farmhouses and beautiful views of the lake. It’s definitely on my list of happy places and it should be no surprise that we already have the wineries picked out for our visit up here in 2019. 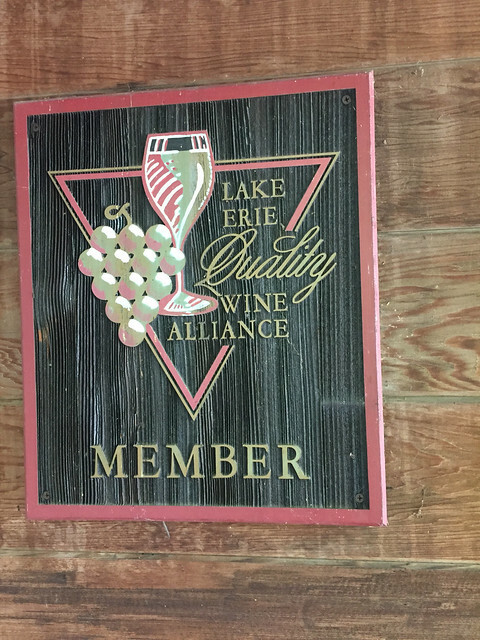 Curious about our other tastings on the Lake Erie Wine Trail?